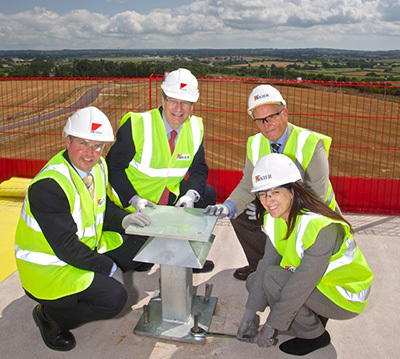 The much anticipated Topping Out Ceremony for the Science Park Centre recently took place to the delight of the parties involved. The practice of ‘topping out’ a new building can be traced to the ancient Scandinavian religious practice of placing a tree on the top of a new building to appease the tree-dwelling spirits of their ancestors that had been displaced in its construction. So on the day in question we gathered, donned the hard hats and marched to the roof of the Science Park Centre for the tightening of a bolt! The tradition marked an important stage in this project which is central to achieving ongoing prosperity for the region. The Science Park Centre will attract and support science and technology business to grow and collaborate with other research institutions across the city and further afield, which will ultimately provide more skilled jobs in the area (estimated 3,000 – 4,000 throughout the entire Science Park). This entry was posted in business, events on 27th Aug, 2014 by Lara Faith Cronin.